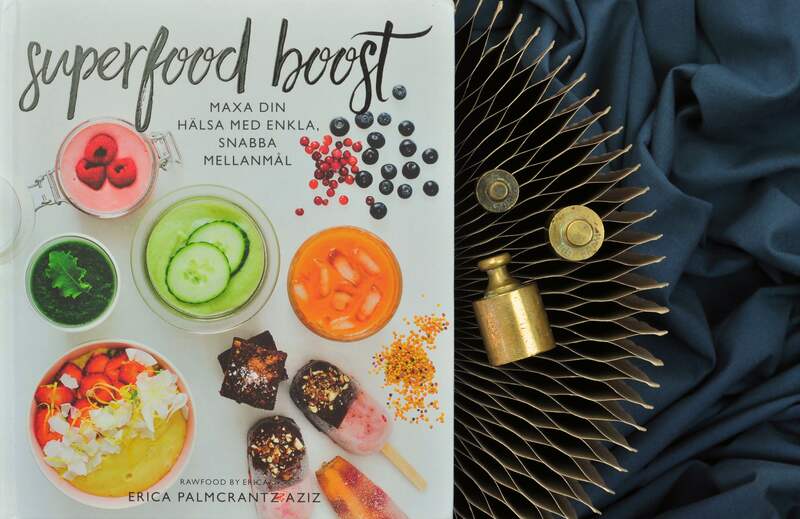 Today I write a review of the Swedish book Superfood boost written by Erica Palmcrantz Aziz. From the book I make yummy crunchy raspberry and coconut cookies. After holidays and summer vacations, it’s time to get back in the routines again. School bags needs to be packed, the weekly shopping are made and important decisions should be made during meetings. Maybe you find yourself in the middle of this, sitting with your own wishes for both you and your family to maintain the energy from the summer and perhaps the new, more healthy habits. Certainly, we all can agree on that we feel better with more vegetables and fruits and less coffee and chocolate for the afternoon dip? This is where the book Superfood boost can get a fun part in your life. The book provides an easy-to-read introduction to (raw) ingredients that makes you feel stronger in your everyday life. Most often with ingredients you can find in your supermarket. After the introduction comes a whole bunch of recipes divided into different categories; bowls and puddings, smoothies and mylkshakes, raw food ice cream, snacks, balls and bars. Tasty and rather simple recipes that can be enjoyed for both breakfast, lunch and whenever you need a snack. Many of them are require some planning, such as soaking before you go to sleep, but once you get used to it, it’s like dancing. You won’t even think about it anymore. As with most rawfood recipes, a mixer, sometimes a standard rod mixer, and sometimes a stronger so-called high-speed mixer are required to grind. But don’t be discouraged by technical requirements, there are lots of good recipes that can be done in a standard kitchen. However, it may require some more time and effort. If you’re already used to raw food, you’ll probably recognize the approaches and maybe even some recipes, but I still think it’s a nice boost to keep on going with your (new) habits. From the book I have chosen to make delicious crispy coconut cookies with raspberries. The cookies are dried in a dehydrator oven, but it is also works well in a low temperature oven on about 50 ° C (even if its then no longer considered raw). Since I couldn’t decide for only the baobap or the lucuma powder, I took half of both instead. The lucuma powder gives a sweetness and the baobab powder enhances the acidity of the raspberries. Both powders gives a binding effect to the dough that can be handy for keeping it all together. Both powders can be found online or in health food stores. The cookies have a fantastic color and are actually just as good to eat both as dough and dried: 0) YUM! Lets get started in the kitchen! 1. Stir together all ingredients in a bowl. Make sure you don’t add the juice from the defrosted raspberries (you can always save it and drink later). The more moist the batter contains, the longer it will take to dehydrate the cookies. 2. Add about one tablespoon of batter per cake to a baking parchment and allow to dry at about in a dehydrator on 42°C, for approximately 20 hours. Store the ready cookies in a sealed container.